This is a handmade leather jacket. It was made and autographed by Ray Comfort, the well-known Christian evangelist, and intended as a gift for Richard Dawkins. You may remember Ray from his many public appearances, including the debate he and Kirk Cameron held against members of the Rational Response Squad and the YouTube video wherein he refers to a banana as The Atheist’s Nightmare. Well, he also blogs regularly. On his blog, he gives items away for free to atheists on a regular basis, as a gesture of kindness. 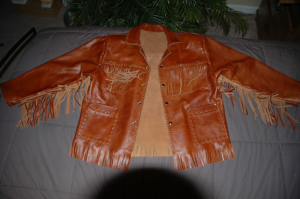 I won his recent giveaway of this handmade leather jacket. 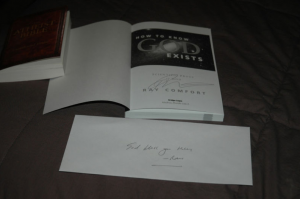 The post about the giveaway is here: http://raycomfortfood.blogspot.com/2010/11/december-is-be-nice-to-atheists-month.html. If you read the comments, you can see that he gave his explicit blessing to my selling it on eBay if I won. This jacket was intended to be a gift for Richard Dawkins, the famous atheist scientist. A video giving the background of the jacket can be viewed here: http://www.youtube.com/watch?v=Tvitmq7KkPE. Because I think the most likely buyer of this jacket is a fan of Ray’s, I want to go to great lengths to authenticate it. The post announcing the giveaway specifies that he will send money. One of the photos shows the envelope in which he kindly enclosed a $20 bill. The handwriting on it matches the autograph on the jacket as well as the autograph on one of his books, which I won in a previous giveaway. If the buyer is a fan of Ray’s, I will be happy to include the autographed book. It is in very good shape. I read it completely one time and then put it on a bookshelf where it remained until I got it down to take this picture.